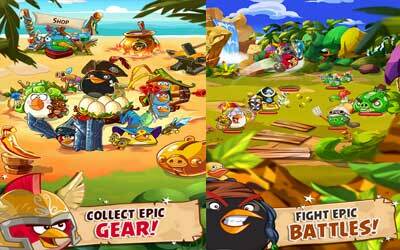 Rovio Entertainment Ltd. releases a new Angry Birds game called Angry Birds Epic RPG APK 1.4.8. From the game name, you might already know that it will be different with previous slingshot game. It is categorized as role-playing game on Google Play Store. It is also categorized as family friendly game. So far, over 10 million users have already downloaded this role-playing game. Advertisement supported family app and in-app purchases are incorporated in it. Therefore, you might need to pay to get certain privilege on the game. As it goes with any Rovio’s games, the graphics uses fun animation to entertain its users. In the Angry Birds universe, you will be able to find all Angry Birds characters including their pig villains. The gameplay will lead you to several epic battles in plain, dungeon, and other interesting places. You need to assemble your feathery team to defeat the enemies in the battle. In this game, several features of role-playing game such as weapon, armor, and potion are also available. Use those feature to upgrade your character and make it stronger. Unique weapons from frying pan and wooden sword will help your character to defeat the pigs. Silly costume and outstanding humor will entertain you during gameplay. If you are able to complete certain task on the game, it will give you an achievement. Complete all the achievements you find on the game. This role-playing game is collaborated to Google Play Games. This feature allows you to continue your game from other device after you connect it to that application. Unfortunately, it does not support multiplayer feature. As the previous Angry Birds game, it is only an offline game with single player feature. However, most users who already play the game do not have problem with this feature. Playing Angry Birds Epic RPG for Android is definitely worth your free time. Go for the gold in our sports event and unlock Blue’s Elite Tricksters! Event collectables are easier to gather! Three wave battles now more challenging, but with extra event medals! Cheaters removed from the Bird Arena matchmaking! Event progress from cheaters will be reset!